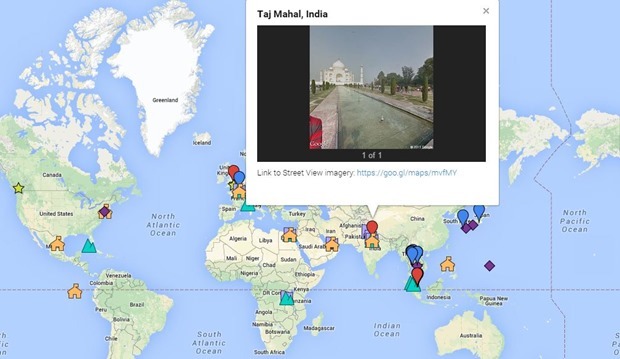 Taj Mahal Most Popular Google Street View Destination! 368 year old Taj Mahal, which is a UNESCO World Heritage Site is the most popular destination for Google Street View tourists. Offline, around 12,000 tourists visit Taj Mahal every day (4.5 million a year). Online tourists from Singapore, Australia, Korea, Philippines & Malaysia visited Taj Mahal maximum number of times. Visitors from India also visited Taj more than any other destination. Cambodia’s Angkor temple is the second most visited destination in Asia, as per Google Street View data. Google Street View came to India in 2011, but due to complain from Bangalore Police, it was banned. In 2013, it came back with only showing monuments and heritage sites. We had reported last year that Google and Archeological Survey of India have teamed up to provide 360 degree virtual tour of the most popular Indian heritage sites, which included Taj Mahal, Red Fort, Humayun’s Tomb , Agra Fort, Ajanta and Ellora caves, the Elephanta Caves. Google has successfully partnered with Maharashtra Tourism Development Corporation, Karnataka Department of Archaeology, Museums and Heritage, Delhi Tourism and Transportation Development Corporation to introduce more heritage monuments and archeological sites into their database. "Taj Mahal Most Popular Google Street View Destination. 31 New Indian Archaeological Sites Added", 5 out of 5 based on 1 ratings.